New York, March 28: Mars' rivers flowed intensely and may have persisted as recently as one billion years ago, reveals a survey that found that the red planet's rivers were wider than those on Earth today. The study by scientists at the University of Chicago catalogued these rivers and found that significant river runoff persisted on Mars later into its history than previously thought. According to the study, published in the Science Advances journal, the runoff was intense and occurred at hundreds of locations on the red planet. 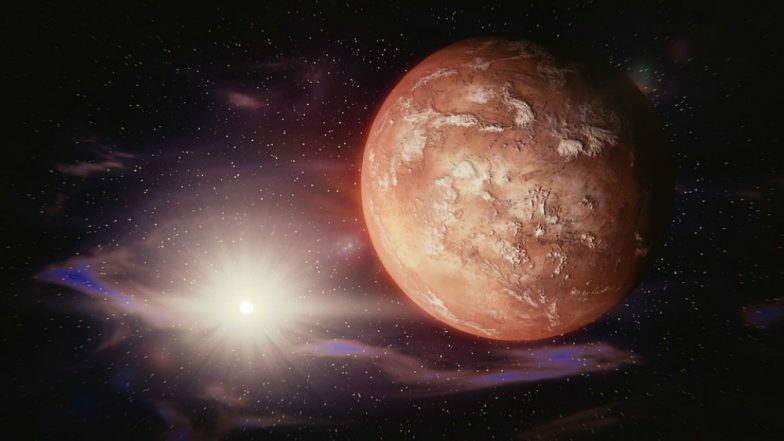 These findings suggest that climate-driven precipitation may have taken place on Mars even during the time that researchers think the planet was losing its atmosphere and was drying out. This complicates the picture for scientists trying to model the ancient Martian climate, said lead author Edwin Kite, Assistant Professor at the University of Chicago. Mars Has Ice-Filled Craters and Twitterati Wants To Go Ice-Skating! View Stunning Images Released By ESA. "It's already hard to explain rivers or lakes based on the information we have. This makes a difficult problem even more difficult," he said. But, Kite said, the constraints could be useful in winnowing the many theories that researchers have proposed to explain the climate. The survey used image data of well-preserved paleo-river channels, alluvial fans and deltas across Mars, and calculated the intensity of river runoff using multiple methods, including an analysis of the size of the river channels. In the river basins, for which there is most data, Mars' rivers were about two times wider than those on Earth. Between 1 and 3.6 billion years ago, and likely after 1 billion years ago, there was intense runoff in these channels, amounting to 3 to 20 kg per square metre each day. The runoff appeared to have been distributed globally, and was not a short-lived or localised phenomenon, the researchers said.